Web API Studio Edition supports image export services for MVC and Wijmo 5 controls. You need to add the Phantomjs.exe file in your Visual Studio Web API application for using image export services. Complete the following steps to add phantomjs.exe file to your service application. Copy and paste the Phantomjs.exe file to the output folder(bin) of your WebAPI2.2 application. In case you do not have Phantomjs.exe file on your local machine, you can download it from http://phantomjs.org/. In the Solution Explorer, right click References, and then select Manage NuGet Packages. 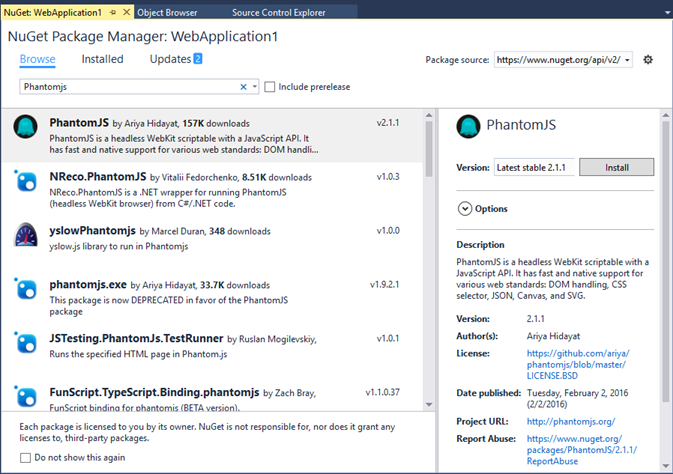 In NuGet Package Manager, input Phantomjs in the search box as shown in the image below. Click Install to add Phantomjs to your application. Copy and paste the Phantomjs.exe file to the output folder(bin) of your WebAPI3 application. In case you do not have Phantomjs.exe file on your local machine, you can download it from http://phantomjs.org/.